This pieceful composition was created with true passion for subject by Palekh artists, Sergey and Maria Gurilyev. This husband and wife artistic team is well known for their dedication to detailed imagery. 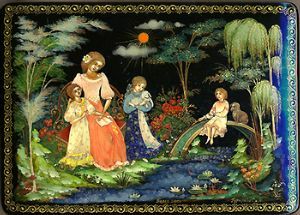 Here the artists have depicted a scene of a family relaxing on a bank of pond. The palette for this piece contains a wide spectrum of bright and vivid colors. Gold paint, applied with extreme precision, details almost every aspect of the composition; the water is detailed with aluminum paint. The detailing with the metallic paints is so fine, in fact, that a brush with no more than a single hair was used in many areas. Like all of Gurilyevs' work, this piece is very well detailed and has its own unique mood. The box's exterior is decorated with intricately painted gold patterns. The box is constructed out of high-quality paper-mache. Black lacquer is used to paint the exterior of the box and red lacquer is used to paint the interior of the box. The lid is hinged from the top of the composition, and the box rests on four rounded legs. The work is signed with the names of the artists and the village of Palekh.